ORDER "GREEN LANTERN: THE ANIMATED SERIES - VOL 2: LIMITED EDITION" NOW. Order now and get your CD booklet autographed by composer Frederik Wiedmann at no additional charge. Autographs are available while supplies last and are NOT guaranteed. La-La Land Records and Warner Bros. 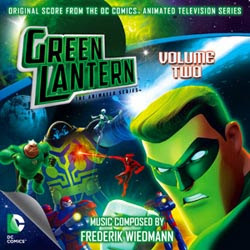 Animation proudly present the original animated series soundtrack, GREEN LANTERN: THE ANIMATED SERIES: VOL 2, the second collection of original score from composer Frederik Wiedmann (MIRRORS 2, JUSTICE LEAGUE: THE FLASHPOINT PARADOX). Wiedmann continues the sensational musical journey he began on the first season of GREEN LANTERN, further exploring the core of this acclaimed series' rich characterizations and super-sized action as it charged into its second and final season. Produced by Widemann and mastered by Doug Schwartz, this jam-packed compilation (more than 75 minutes!) features the very best of the exciting rest of GREEN LANTERN: THE ANIMATED SERIES! This is a limited edition of 1500 Units. Green Lantern is a great series and he music always feels epic.